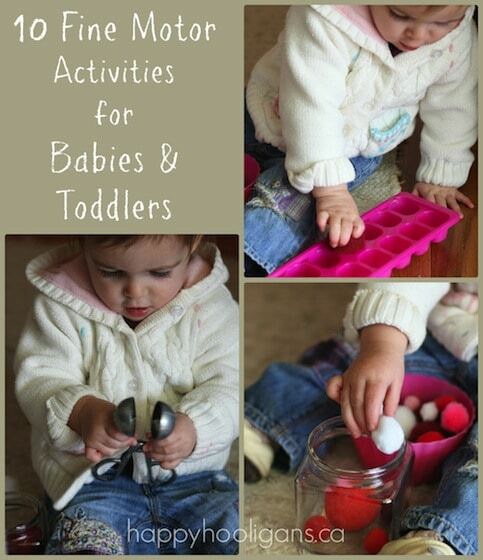 The following 10 fine motor activities for babies and toddlers encourage creative thinking and problem-solving. 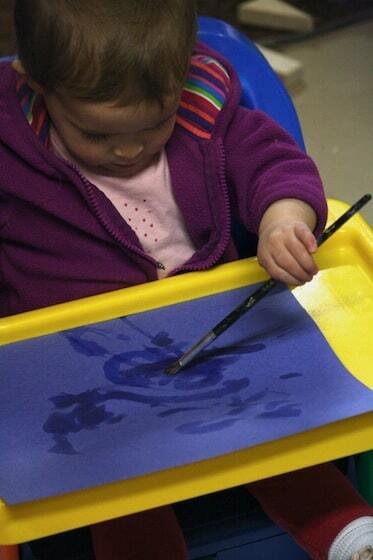 They help to develop a young child’s fine motor skills, hand dexterity and co-ordination through play. I often set up with simple activities up to keep the toddlers and babies busy while the preschoolers are crafting here in my daycare. The activities require common house-hold items, and they’ll keep baby entertained, engaged and learning. 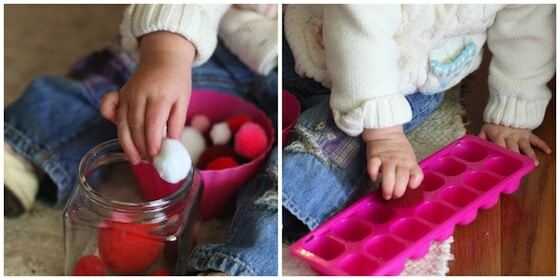 Provide an ice cube tray or a jar for baby to transfer fluffy pompoms into. 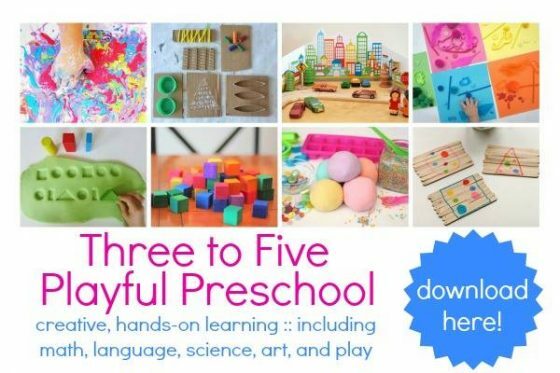 This toddler activity helps develop pincer grip and hand dexterity. Your baby will also explore shapes, sizes and sorting. 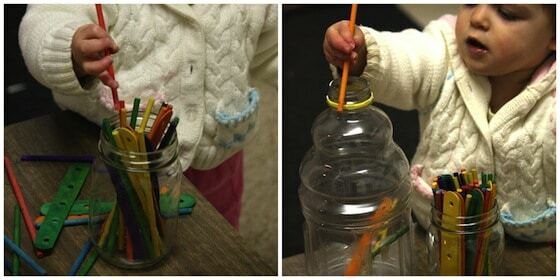 Set out a jar filled with colourful craft sticks and have your baby transfer them to a juice jug with a narrow opening. This activity is great for developing pincer grip and hand-eye co-ordination. Your baby will love the sound the sticks make plunking into the hollow bottle. Set a bowl of corks next to a small mouthed jug. 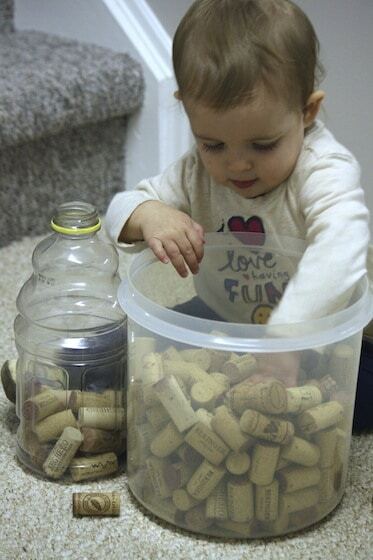 As your baby transfers the corks to the jug, she will examine the texture, size and shape of the corks, and she’ll strengthen her fine motor skills and hand-eye co-ordination. This activity can be set up on the floor, but I often set it up on a coffee table, so baby has to stretch and reach to use it. This makes it a gross-motor activity as well. 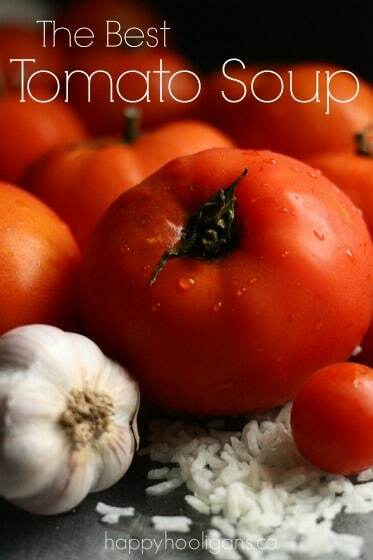 This one is great for keeping the baby busy while I pack school lunches. A potful of oranges to transfer to a sectioned tray. Look at the size of the orange compared to the baby’s hand. This would be like your or me handling a small watermelon. Hand and muscles are given a real work-out with this one. I’ve set up this art activity for babies many, many times over the years. A piece of construction paper, a small bowl of water and a paintbrush is a mess-free way to keep the baby happily entertained while the older kids are crafting. Muffin tins are an invaluable instrument for play and learning in the daycare. 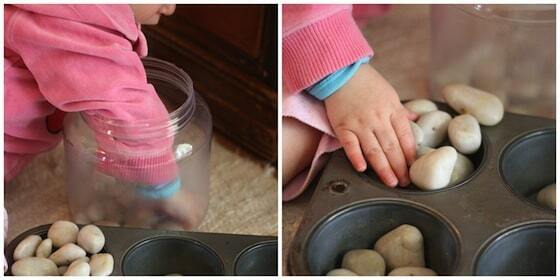 Here, the baby is sorting polished beach rocks into the muffin tin. This muffin tin gets played with almost every day. Toddlers and preschoolers use the muffin tin for sorting letters, farm animals, glass beads, foam blocks. Never underestimate the value of the humble muffin tin! Provide your baby with a variety of instruments to explore. Here, along with the ice cube tray and jar of pom poms, the baby has some meat-ball tongs, a coffee scoop and some ice tongs to experiment with. She’s too young to actually use the tools to pick up the pom poms, but she’s squeezing and prying them open and closed. These first steps help her prepare for the day when she will hold a pencil or a pair of scissors. Craft foam is great for so many purposes, and when it’s wet, it sticks to smooth surfaces like bath-tub tiles, windows, and the surface of this smooth bowl. 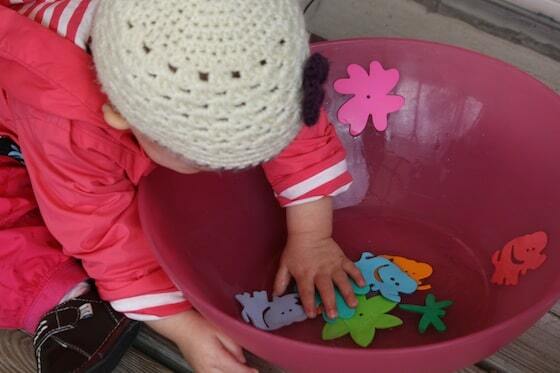 For this activity, I put a dribble of water in the bottom of the bowl, and the baby swishes the shapes around, and sticks them to the side of the bowl. The toddlers get paintbrushes, and they’re invited to decorate our sliding glass door. 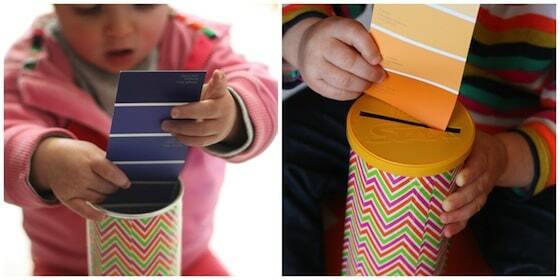 Colourful paint swatches are a visual treat for baby or toddler to explore and fine motor skills will be exercised as your child drops the swatches into the narrow opening of the can. For babies, I leave the lid off the can, as the opening presents enough of a challenge. For toddlers and preschoolers, I cut a narrow slit in the lid with an Exacto knife. 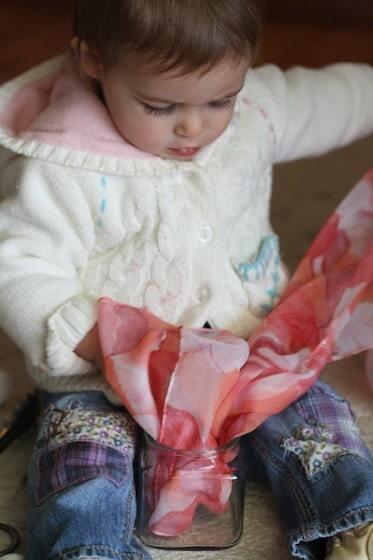 Playing with a silk scarf is a lovely sensory experience. 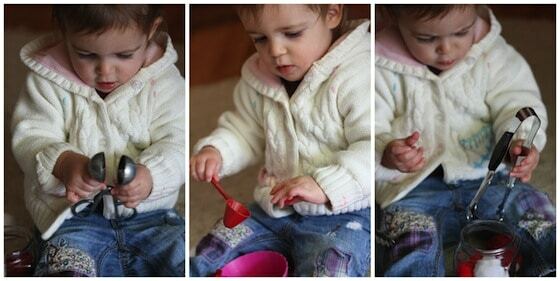 Stuffing the scarf into a jar, and pulling it out, hand-over-hand, provides lots of fun and learning. 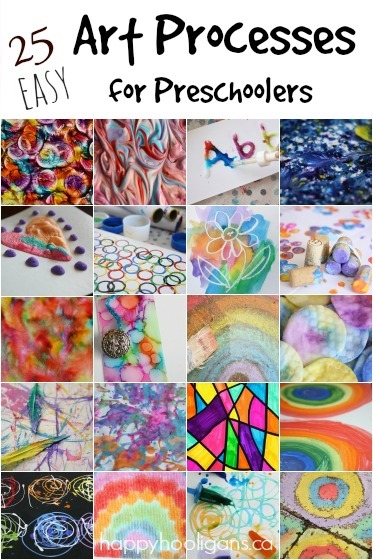 When can you introduce your baby to these fine motor activities? You can begin doing some of these activities with your baby as soon as they’re able to sit unassisted. For the activities with smaller objects in them, like pom poms and stones, please wait until there’s no risk of your child putting them in their mouth. With all activities, supervise closely to ensure the safety of your child.. These are great! Thanks for the ideas! What fun!! Cute little baby!!!!! I love your ideas for all ages! I would love to see how you store all of your supplies! Could you do a post on that? I am amazed at how much fun my 2-yr old has with a geoboard and some rubber bands…he is a young 2 (26m) but the challenge of securing those bands and making designs keeps him absorbed for nearly 20 min at a time. That’s great, An’e! I really have to make a geo-board for the hooligans. Great ideas, so simple, but the sort of stuff I can never think up on my own. I’m off to email the link to my sister, she’s just started doing lots of play with her first and I know these will spur her on. Thanks for sharing it, Hannah! What age are these activities good for? I’m a new mother, and i don’t really know when they should be able to do any of this stuff. Thanks! Hi Maria, follow your child’s lead. 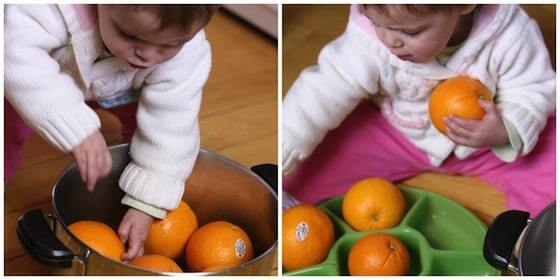 Very young children will show an interest in putting objects in and out of a basket or bowl. In the photos in this post, the baby is just over 12 months, but as long as there’s no risk of choking, you can certainly start younger than that. 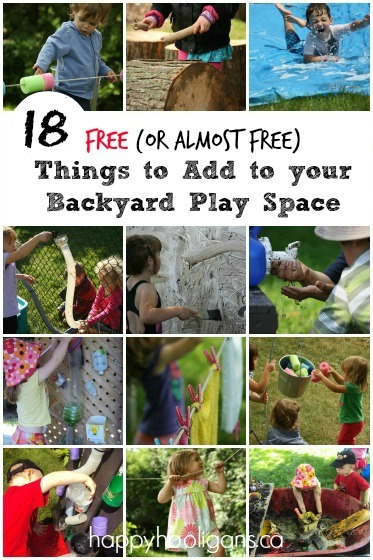 This is a wonderful list of activities for little ones! 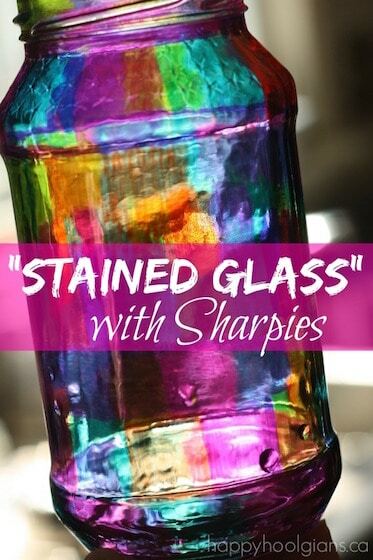 I especially like the paint swatch and pringle can activity – so simple, creative, and fun. 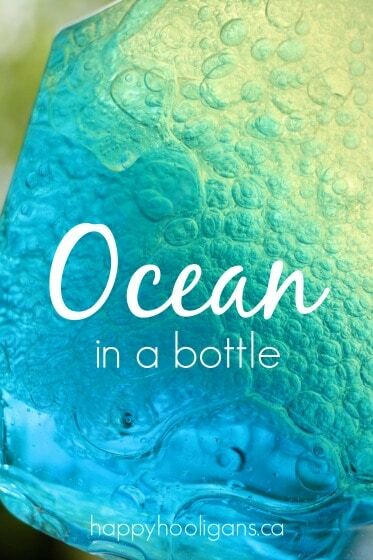 I am definitely pinning this! My son, who is 20 months, loves painting with water! I watch my cousin s son who is 13 months old and he would love all but the rubberband game. At this time he is putting too much in his mouth. I will keep that for late . What rubber band game are you talking about, Judy? 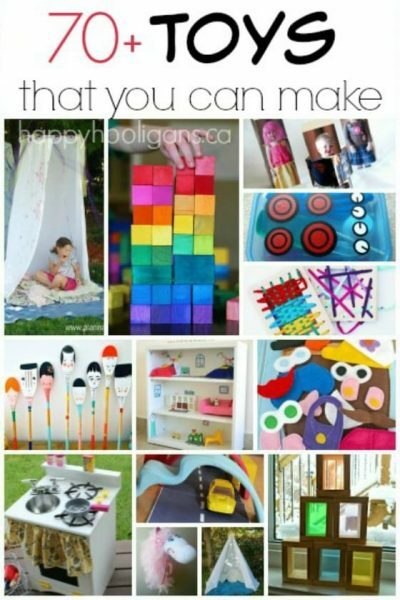 What fun activities for little ones. i love the craft foam in a bowl idea, the silk scarf and the orange in a tray activity. I am wondering where you would get a whole bunch of corks like that. I would love if you could stop by and share on Toddler Idea Tuesday! I super love it! Now I’m looking forward to the weekend to do some of this with my 1 year old! Wow! Love it! These are so awesome! I can’t wait to try them out! Purely from a professional stand point… all of these but about 3 are choking hazards for the age of the child shown in the pictures. I only post this as a caution to parents. A good rule of thumb is …if it can fit into a toilet paper tube …it is a choking hazard and should not be used for children under 5.